Iaido is the art of drawing the sword, cutting, and returning the sword to its scabbard. Iaido does not include direct competition or sparring of any kind. Because of this non-competitive aspect, and Iaido’s emphasis on precise, controlled, fluid motion, it is sometimes referred to as “moving Zen.” The practice of Iaido is a great approach to finding an appreciation for the here and now, battling an imaginary individual or individuals, becoming one with the sword and using meditation in motion. WHAT DOES IAI TATE DO? Iai Tate Do literally translates as the way of mental presence coming together in the battlefield. It is the culmination of a number of traditional Koryu or traditional Japanese school of martial arts. This culmination includes such Koryu as Omori-ryu and Muso Jikiden Eishin-ryu. However, Iai tate do is mainly based on the Kashima Shinto-ryu and Suio-ryu systems. Kashima Shinto-ryu was founded by Tsukahara Bokuden in the late Muromachi period of Japan (circa 1530). Due to its formation during the tumultuous Sengoku Jidai, a time of feudal war, the school’s techniques are based on battlefield experience and revolve around finding weak points in the opponent’s armor. Suio-ryu was founded by Mima Yoichizaemon Kagenobu in the early Edo period (circa 1615). Yoichizaemon’s perseverance in both his physical and spiritual training led to his eventual enlightenment. In his twentieth year of exertions he was struck with a vision of white gulls floating effortlessly and without conscious thought on water. He realized he could now use his sword in the same effortless manner. Based on this vision, the birth of Suio-ryu or Water Gull Sword style arose. 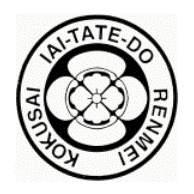 With Kiyoshi Yamazaki’s busy schedule, he appointed top student Roger Jarrett Sensei to take charge of the International Iai Tate Do Federation. Master Roger Jarrett has over 40 years experience of studying, teaching, training and competing in the martial arts. Throughout those years, he has sought out and trained with some of the foremost martial arts experts in the world. A former National Champion and Karate All-American himself, he has trained numerous national, international, and world Karate champions. He now travels the world refereeing, coaching, training, and teaching. Jarrett Sensei is also the President and Chief Instructor for many martial arts organizations including: USA Martial Arts Training Centers, USA Martial Arts Federation, Chong Shin Tae Kwon Do Karate Association, USA Aikido Association, USA Judo/Jujitsu Association, USA Iaido Shoshin Ryu and the International Iai-Tate Do Federation. Hodgins Sensei started training in 2009 under Kevin Blok Hanshi of the Chudokai Aikido Federation International based in Windsor Ontario. Sensei Hodgins was promoted to Nidan, second degree black belt in Iai-Tate-Do in June of 2012 by Blok Hanshi. A student of several martial arts, Hodgins Sensei is also a Nidan in Aiki Buki; an aikido based weapons art developed by Kevin Blok Sensei and holds a rank of Nidan in Yoshinkan aikido.